Review: "Trigon: Emergent" - Sea of Tranquility - The Web Destination for Progressive Music! 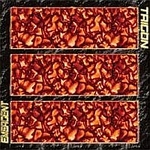 Trigon calls themselves a 'Zen jazz' band. After hearing Emergent, though, you'll probably prefer to call them something like a psychedelic / progressive jam-rock outfit straight out of the 1960s. That's a lot of words, but read on and you'll get the picture. Psychedelic Rock is described as attempting to replicate the mind-shifts and the audio visual imagery experienced under certain drugs. The first artists to bring psychedelia into their music were in the jazz and folk genres, but the Grateful Dead and Floyd, and certain Beatles albums also brought the style to a limited but appreciative audience. Whether Trigon meant to introduce this trippy connotation to their music or not is irrelevant - it's there, in spades. We're still trying to figure out the "what is prog" question but with its intelligence, high standards of musicianship and constant shifts, we'd guess Emergent qualifies. As usual, the German trio plays all-instrumental music with drums and bass at the bottom end, and a lead guitar that dominates most sections on most tracks. Udo Gerhards plays keyboards on 4 of the 13 tracks, but his contributions are kept to a minimum and held back somewhat in the mix. In our review of Burg Herzberg 2004 we said "Trigon's sound is about vibe and flow rather than song and structure". That's still true, but comparing the sound on Emergent with that live album - there's no flugelhorn here and the keys are less prominent, but Rainer Lange's brilliant guitar work is more imaginative and Emergent gets into a deeper psychedelic groove - a head-nodding rhythm that will have you zoning out in just a few bars. You'll hear a lot of old fashioned sounds here ranging from Zappa through Satriani to a strong Hendrix inspiration (on "Mission Critical Dropout"). The bass sometimes takes lead (parts of "Fette Beute"), and its omnipresent jazzy upper-register high-energy rollicking drives every section of this music. You'll have no idea what the songs mean, and with this style of music it doesn't matter, but the quirky bilingual track titles might lend a clue - with song names like "Kamasutra Debakel" and "Space Chick Strikes Back". The guitar defines the sound on this record, Stefan Lange's and Tihomir Lozanovski's rhythm section keeps the groove up, and that jamming ensures its loose structures and the easy flow down that tranced-out rocked-up jazzed-in slippery road to psychedelic nirvana. Emergent will draw you into its clutches for a 66 minute Zen-like chill-out session - and when you finally emerge, the world will be a brighter place imbued with primary colors that sound like guitars, your head will still be nodding to the groove that just won't stop, and your brain will look like a lava lamp. Yup - this is a trip back to the '60s.